We start with a stock great sounding classic 60 watt Celestion Vintage 30s . We then convert it into a Hellatone by exercising the suspension for 15 hours so when you get it, it has a warmer tone on the very first note. This process warms up the low end and smooths out the midrange slightly. 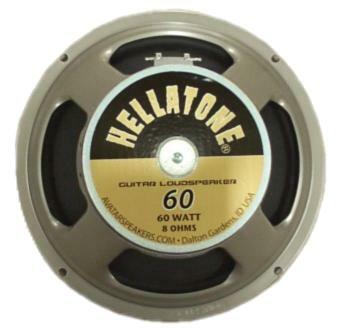 The Hellatone model 60 really projects and is great for all kinds of music, especially Rock and Metal! Large heavy 50 oz magnet!